We left Marrakech, with it's stifling afternoon heat, souk holders pushing handfuls of mint towards us whilst shouting "excuse me, what's this? Not marijuana, promise" and swearing angrily when we tried to move without buying anything. 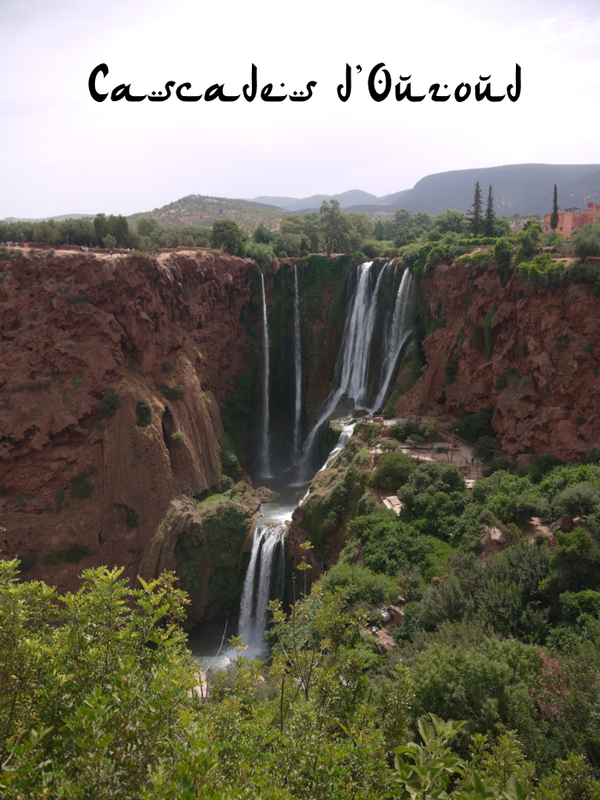 Seduced by a description that it is "not too far removed from the Muslim idea of Paradise" and the many signs offering excursions there we packed our bags and went into the Atlas Mountains. There are plenty of local buses that run daily from the small bus station, don't bother going to the CTM or Supartours bus stops run out of the main train station they don't run buses to Ouzoud. Instead you must look for the Gare Routiére just outside the North West wall of the Medina, it's quite grotty and you will hassled again by people trying to make you buy whatever they’re selling regardless of what you want. There is no direct bus to the small village of Ouzoud (unless you take an extremely over priced excursion day trip run by a hotel or travel agent) catch the bus that is heading to Azilal. You can haggle somewhat for your ticket price, this being Marrakech, and you presumably being a tourist, the first price they give will most likely have been inflated. If you have luggage with you it will cost 10 Dirham to have it stowed beneath the bus, have the money ready or the attendants will help themselves to whatever they can see when you get your wallet out. Honestly, a man snatched a 50Dh note out of Boy’s hand and when we started shouting for change they all lost the ability to speak any English. I can’t say I was that sorry to leave Marrakech. Azilal is a turd of a town three and a half hours away from Marrakech, our guide book insisted that it had a sleepy village air about it and would be easier to find reasonable accommodation and restaurants there than Ouzoud. This is a lie. We went to Azilal, walked from the bus stop to a hotel, very aware we were being stared at the whole way. At the hotel, recommended by the guide book, we were shown a room that- going by the layer of dust over everything- hadn’t been occupied since the previous year. 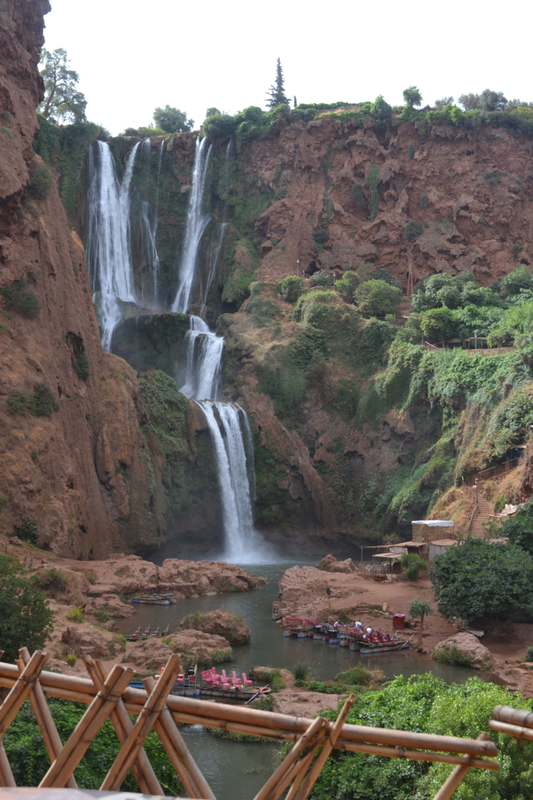 If you want to see the waterfall at Ouzoud (you do) the only reason to go to Azilal is for the ATM. We walked out of the hotel, back to the bus station and hailed a grand taxi to take us to Ouzoud. Travelling from Marrakech there is a turn off about half an hour before you reach Azilal where you can leave the city bus and get into one of the taxis hanging around to take people to Ouzoud. That is what we should have done in the first place. 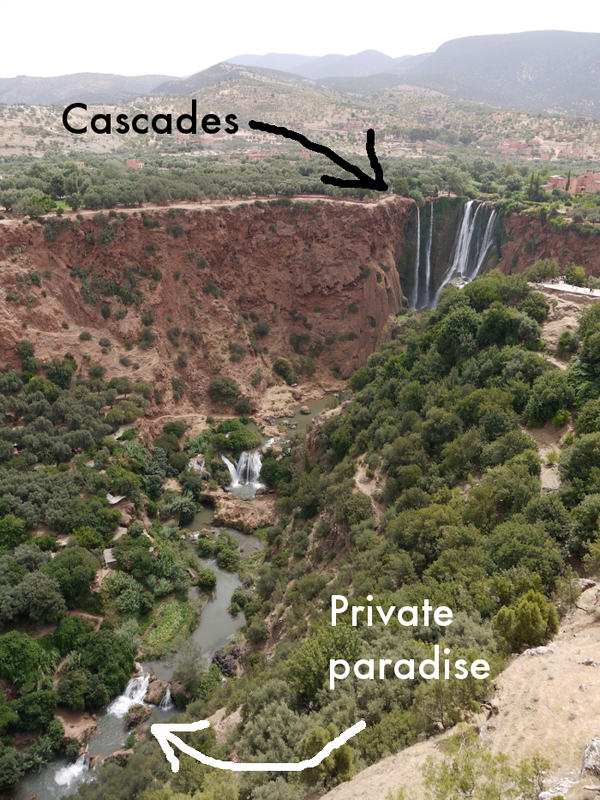 A leftover of the French occupation the Ouzoud falls go more commonly by their French name Cascades d’Ouzoud. It might just be my tendency to over romanticise everything, but ‘Cascades’ brings to mind something much more mysterious and elegant than ‘waterfall’. Falling in rivulets for over 100 metres against clay and limestone overgrown with vegitation. One of the best parts of spending a few days there was seeing how the different the cascades looked at differnt times of day, the sun doesn't hit them until mid-afternoon becasue of the valleys high sides but when it does they glisten. Ouzoud is very out of the way because of this hardly anywhere has Internet access, even the restaurants and cafes that do have sketchy access. It seems to me then there are no real reasons not to walk down the 679 steps carved into the hillside, cross the river and find accommodation on the valley floor where you can wake up to views of the falls in all their glory. 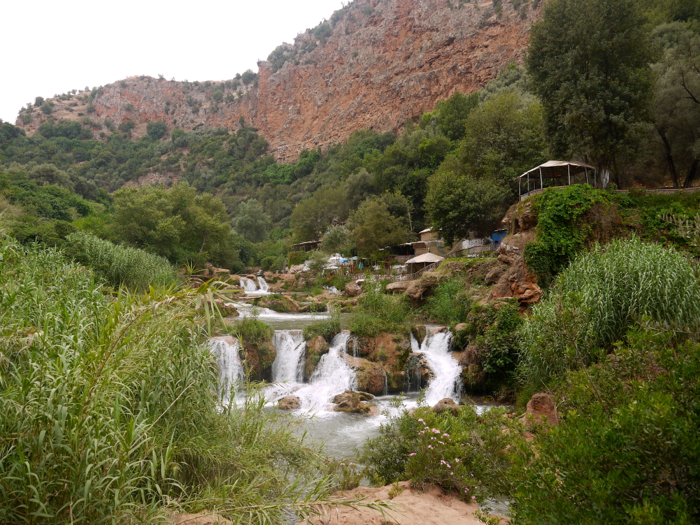 We stayed at the Le Panard campsite, although tempted by the Berber tents the fact they didn’t look that secure made us plump for a room with a double bed and a solid lock for 120Dh (less than £9) a night. In retrospect I’m not sure I would make the same decision again, I never felt anything but perfectly safe in Ouzoud, and after Marrakech the feeling that I wasn’t surrounded by thieves and people trying to rip me off made a wonderful change. Plus the room ended up being quite stuffy, that doesn't really happen in tents. Le Panard was staffed with wonderful people and very close to a delicious restaurant where we ate almost all our meals looking out at the full splendour of the cascades. The steps down to the valley floor are lined with souvenir shops and cafes offering good food at fair prices, I was amazed there wasn't a mark up for the view they were accompanied by. If you walk down to the Al Ebid River and follow it downstream you will pass numerous cafes that have sprung up on the banks next to places where the river slows and pools. For breakfast and dinner we usually ate looking out at the cascades but for lunch we would hike out (I say hike, I think the furthest one we went to was 2 miles away) to one of the river bank cafes where we could enjoy the serenity of our own private swimming pool. 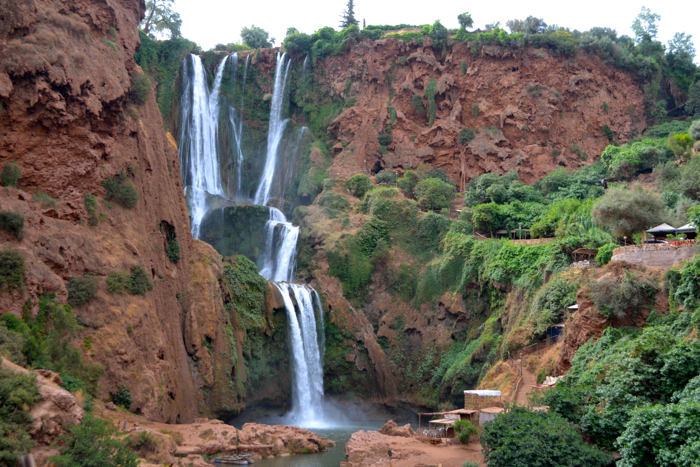 Be warned, the water comes down from the snowy peaks of the Atlas Mountains and is glacial. 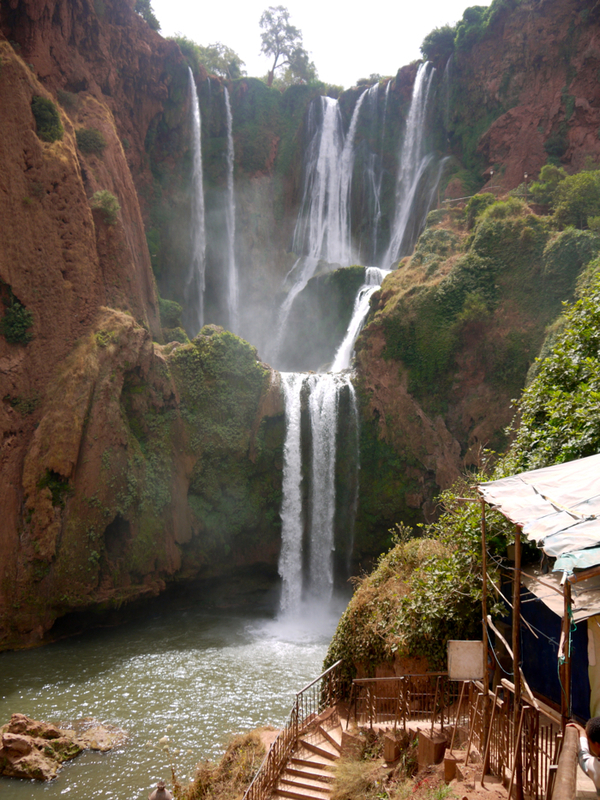 If wild swimming isn't something you fancy even a little bit, just sit on the banks and enjoy the view, Morocco is a birdwatchers haven and even if you aren't a twitcher isn't difficult to deny the relaxing powers of abundant nature. Ouzoud has a very relaxed atmosphere, in Marrakech stall holders would shout and demand you buy their wares, in Ouzoud people would ask where we were from out of interest, not as an opening line for their sales pitch. There was a wonderful sense of community spirit, in a village with less than 2000 inhabitants I suppose it's very easy for everyone to know everyone. A lot of the cafes and families grow their own herbs and vegetables, for their own needs as well as to supply customers. Quite a few people grew things more recreationally as well, and a lot of them were fans of listening to Bob Marley. On the third day I overheard a man ask his companion "Yeah, they're impressive and it makes a nice change to Marrakech, but was it really worth £100 and six hours on a coach to get here and back?" The answer is no, you need much longer but not really any more money to appreciate this stunning place and the people who make it even more special. Do go! These pictures don't come close to doing it justice. Wow! I love the night shot. And also the one of your "breakfast view". I can't even imagine waking up to that stunning sight! It was one of those things that we were initially disappointed when we realised we'd be out in the mountains where the air is so clear and there's very little light pollution during a full moon because we wanted to go star gazing, and the moon was so bright we couldn't see many stars. 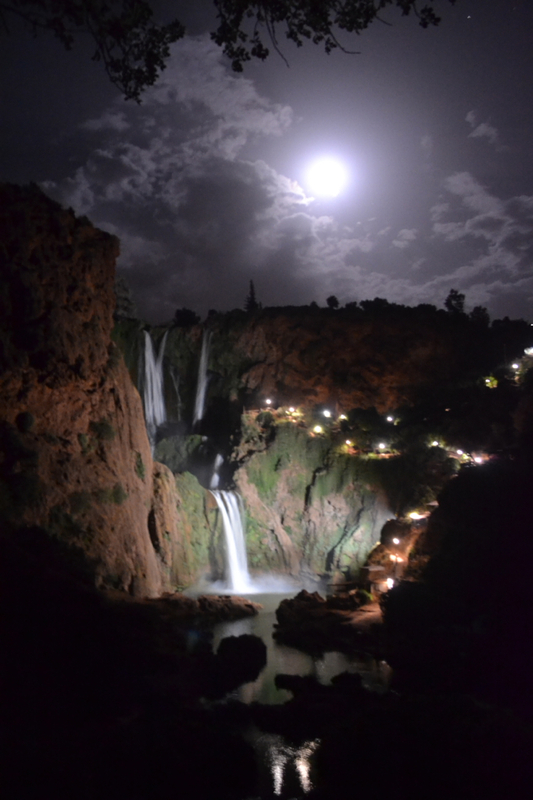 But then we saw the waterfalls with the full moon and suddenly didn't mind. This looks beautiful. I didn't even know it existed. I spent a week in Marrakech and went on a day tour to the Atlas Mountains. I wish I'd known about this! I thought your 'Suddenly forgot how to speak English' statement was a bit off. Have you suddenly forgotten to speak French or Arabic that you must rely on the world speaking English? Learn another language. Even a little bit will open doors. I like your description of the falls (I'm going there in a few weeks) and the information is very useful, thank you.